I should explain something. I was laid off from my job a while back and am currently looking for work. 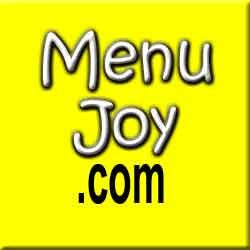 Having said that, Mom and I have been choosing our restaurants very carefully this month. 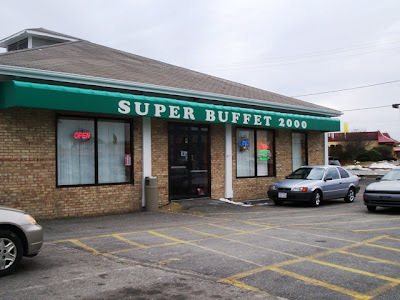 We've been visiting places that we know are going to give us a lot of food for a little bit of money, and on today's adventure, there was no place that better fit that description than Super Buffet 2000 in Fall River. With the weather being dreary and our stomachs growling, we pulled into the parking lot at around 3 p.m. Mom loves this particular buffet, and we were both looking forward to having Chinese food because we don't have it often. When we walked in, we headed toward the area closest to the buffet (God forbid we have to walk around with full plates). A nearby Asian waitress in a black and white uniform motioned us over to her and asked us if we would like a table or booth. We choose a booth as she asked us what we would like to drink - two Diet Pepsis. After the waitress walked away to get our drinks, Mom and I put our purses on the seat (carefully "hidden" under our jackets) and proceeded to the buffet steam tables. The inside of this restaurant is very pretty and unique. It has a very art deco look, with its light grey wallpaper with pink touches and a dark green rug. Wood and glass panels with a V-shaped design separate the diners from the steam tables, while large crystal chandeliers hang above the cashier and the buffet area. There is a soda machine next to the cashier area, along with some Asian inspired decorations and a variety of faux plants. With a mixture of both tables and booths, the dining room here is fairly large, which is good because this restaurant always fills up fast. There are lights in the ceiling tiles, and venetian blinds in every window. Napkins and silverware are set up on each table, while a row of Styrofoam containers wait next to a scale for those who are going to be getting take-out from the buffet. The floor around the buffet is of a linoleum texture, which tends to get a bit slippery when the steam tables are at their hottest. I've had to hold onto the tables while making my rounds on a few occasions, and Mom has also mentioned the same thing. Unfortunately I could not get a picture of the steam tables, as there would have been a lot of people wondering why I was photographing them while they were picking out food. 1) You either seat yourself, or someone will show you to a table. 2) You place your drink order with the waiter or waitress. They will be at the table when you get back. 3) You leave your seat, and head over to the buffet tables. 4) You grab a plate and/or silverware from the head of the buffet table (although most restaurants have the silverware already at the table for you). 5) You fill your plate, sit down, stuff your face, and then go back for more. It's all you can eat! There are three large steam tables here, along with a fourth table which has homemade desserts at one end and an ice cream freezer at the other. With so much to choose from, I had to make the difficult decision of what to choose on my first trip, and what to come back for the second time around. As I weaved in and out of the other patrons mulling over the different varieties of chicken, I spotted Mom doing the same. We met by the fruit chicken (our favorite) and I informed Mom that I was done filling my plate and was headed back to the table. A few minutes after taking my seat, Mom joined me. 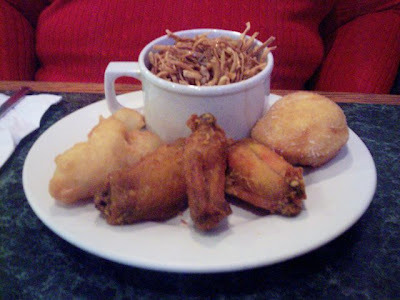 This first time around, Mom chose the fried chicken wings, chicken fingers, a Chinese malasada (a fried dough with sugar), and a cup of chow mein (with sauce that she strained). I chose the crab rangoon, fruit chicken, chicken fingers, sesame chicken, General Tso's chicken, teriyaki beef, a dumpling, and a Chinese malasada. Everything was so good that when our plates were empty, Mom and I headed over to the buffet for round two. This time, Mom chose the mashed potatoes and fruit chicken, while I went with a cup of chow mein (also with strained sauce). When we arrived back at our table, we noticed that a waitress had taken away the empty plates. Again, everything was delicious. Both Mom and I feel that every Chinese food meal should be followed by ice cream, so that is exactly what we did. We went up to the ice cream freezer and each selected a flavor. I chose black raspberry, while Mom chose coffee (no surprise there). It is a scoop-it-yourself kind of thing, so we were both there for a while trying to get the frozen ice cream out of its tub. However, all that work paid off because both cool treats were great. In Mom's opinion, of the Chinese buffets in our immediate area, Super Buffet 2000 has some of the best tasting food. The staff keeps the trays well stocked, and everything is always nice and hot. I completely agree. Everything really hit the spot. 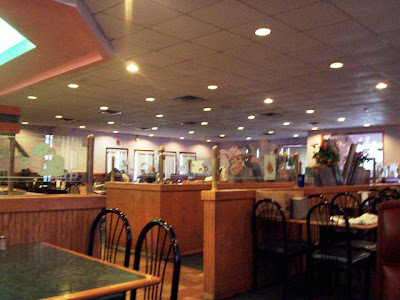 Super Buffet 2000 is a Chinese restaurant that serves Szechuan, Hunan, and Cantonese cuisine. Aside from their large buffet, they also have a regular menu available. For the buffet, the price is $6.50 Monday through Friday, and $7.50 Saturday and Sunday for lunch, and $9.75 daily for dinner. These prices include soda and ice cream. Lunch is served from 11 a.m. to 3:30 p.m. daily, while dinner is served from 4 p.m. until close. Children under two eat free, and between the ages of two and 10, lunch is $.50 per year while dinner is $.70. Over 120 items are served at this buffet, including all the usual Chinese favorites like chow mein, crab rangoon, egg rolls, lo mein, and General Tso's chicken. Regular menu lunch specials include plates such as teriyaki beef ($4.55), Moo Goo Gai Pan ($3.90), and pepper steak ($4.05). Dinner specials are all $7 and include pork fried rice. Combinations include boneless ribs, teriyaki beef, and chicken fingers; egg roll, chicken wings, and boneless ribs; and golden fingers, egg roll, and crab rangoon. Combination plates are available, and each plate comes with pork fried rice and an egg roll. Prices for the plates are between $5.20-7.15. The chef's specials are served with white rice and include a seafood combination plate ($10.55), shrimp and pork Szechuan style ($8.55), shrimp and scallop with garlic sauce ($8.90), and the Happy Family, which is fresh shrimp, lobster, chicken, roast pork, and beef blended with mixed vegetables ($8.90). There are also several varieties of appetizers ($1.05-9.55), soups ($1-2.45), fried rice ($2.75-7.95), chow mein ($1.50-8), chop suey ($2.65-8.20), egg foo young ($4.80-6.80), lo mein ($3.55-7.55), mei fun ($6-7.55), vegetables ($3-6.20), seafood ($4.80-8.75), beef ($3.80-7.50), roast pork ($3.70-7.40), chicken ($3.95-7.90), and moo shu ($6.20-7.05). Serving beer and wine, Super Buffet 2000 has gift certificates available, and a banquet facility that seats up to 200 guests for anniversaries, parties, and business meetings. We left $19 on the table for our waitress, which included a 20% tip. Some people don't tip at buffets, but we always do. After all, buffets tend to be really busy. Those people work hard! Before leaving, I decided to use the restroom. The restroom here is usually OK, but today it was on the disorganized side. It is never dirty, but it always seems that - because of the traffic - it is hard to keep a handle on the restrooms. After returning to the table, Mom and I left the restaurant. She grabbed a take-out menu before leaving, and as we were walking out of the building we spotted a sign that informed patrons that they will be charged an extra 20% for wasted food. We couldn't agree more. Both Mom and I hate to see people fill up their plates with food, take two bites of something, leave it there, and then go up for more. All-you-can-eat does should not mean that people should be wasting food. If you can't eat a lot, don't take a lot. The tables aren't going anywhere. You can always get up for more. Super Buffet 2000 also happens to be one of my father's favorite restaurants. He loves their lo mein and the egg foo young, and always offers to take Mom here on their nights out. Whether you chose something off the menu or take advantage of their delicious buffet, you will definitely leave this restaurant with a full stomach, and a full wallet. Super Buffet 2000 is open from 11 a.m. to 9:30 p.m. Monday through Thursday, and again on Sunday. On Friday and Saturday, the restaurant is open from 11 a.m. to 10:30 p.m. 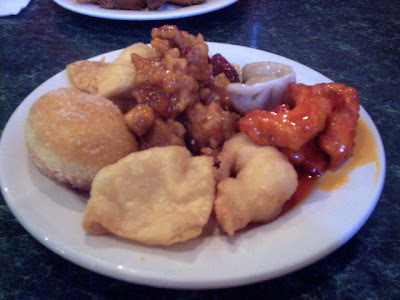 If you live in the Somerset area, visit their sister restaurant - the New York Chinese Buffet on Slades Ferry Avenue. Super Buffet 2000 is open on all holidays.